Now that the Kindle Fire HD is out from under wraps, it's time to start looking at how that TI OMAP 4470 chipset and 1900x1200 pixel screen compare to what the other notable tablets have to offer. So we lined up the specs of the original Kindle Fire, Google's Nexus 7, Samsung's Galaxy Tab 2 7.0, the iPad, and the just-announced Kobo Arc to give you an idea of where it excels and where it doesn't (on paper, at least). Amazon claims that its dual-core chipset can perform as well as the Tegra 3 (more specifically, that it has "greater memory bandwidth"), and the pixel density of the 8.9-inch screen is second only to the iPad. Additionally, there's a 7-inch model with a resolution of 1280x800 that's selling for $200. This is on par with the displays of the Nexus and Kobo Arc, as well as the price of those tablets. Also impressive is the 0.35-inch thickness which is tops among the current crop of standout tablets. But somewhat of a downer is that the custom OS skin is built on top of last year's Android 4.0 release (aka Ice Cream Sandwich). 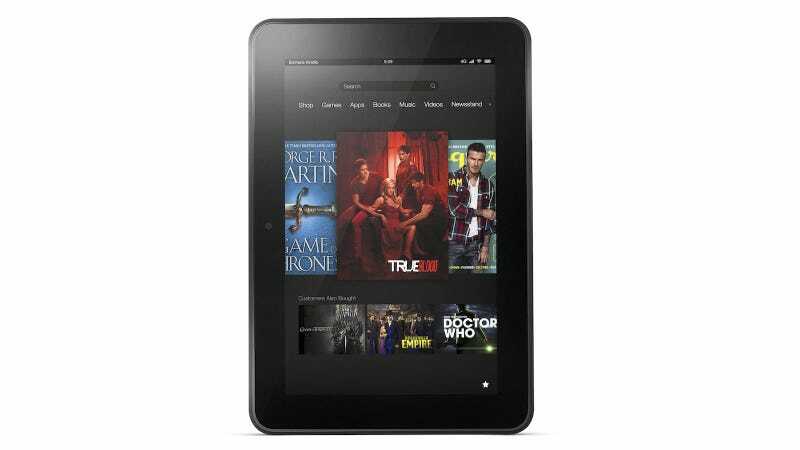 This means none of Jelly Bean's UX and performance enhancements—such as Butter—will manifest themselves in the Kindle Fire HD. This means that the Nexus 7 will have a significant advantage in that area. One big plus for the Kindle Fire HD is the inclusion of 4G data for $50 a year. Yes the iPad also has 4G, but paying $4/month for enough bandwidth to check email and surf a few web pages in a pinch seems like a pretty sweet deal. All in all, the Kindle Fire HD may not be able to claim inalienable supremacy, but on paper, it will be in the mix when people are discussing notable tablets.